The Demoiselle crane (Anthropoides virgo Linnaeus, 1758) belongs to the order of the Gruiformes and to the family of the Gruidae, which includes two subfamilies, the Balearicinae (the so-called crowned cranes) and the Gruinae (the typical cranes), and counts 15 species, grouped in 4 genera, among these Anthropoides (Viellot, 1816) to which this species is nowadays assigned. The Demoiselle crane is by sure one of the most elegant animals of the winged world. The etymology itself of the vulgar name has wished to emphasize the features, the grace and the posture this bird assumes when on the ground and its scientific name Anthropoides virgo summarizes its characteristics. From the Greek “anthropoids”, similar to a human being and from the Latin “virgo”, girl. Also its current name of Demoiselle rightly indicates “a young lady”. Even if this behaviour was already known since the times of Aristotle who had even compared it to an actor, to a comedian on the stage, so much graceful was its gait, Albin (1738) and Viellot (1825) who compared them to the Bohemian dancers. This nickname seems to derive from an interpretation given by Marie Antoinette at the Palace of Versailles by the second half of the ‘700 when, having been presented this crane for the first time in Europe and seen the grace of the movements and the harmony of its dances, identified it immediately as a “Demoiselle”. Then, after her questioning about its provenience, they told her from Numidia, present Tunisia, coupling to the name a probable but unaware geographical mistake seen that already at that time and even more today, this bird is practically unknown in that location. So, here is then baptized our Demoiselle, name which is practically repeated in whatever European language. 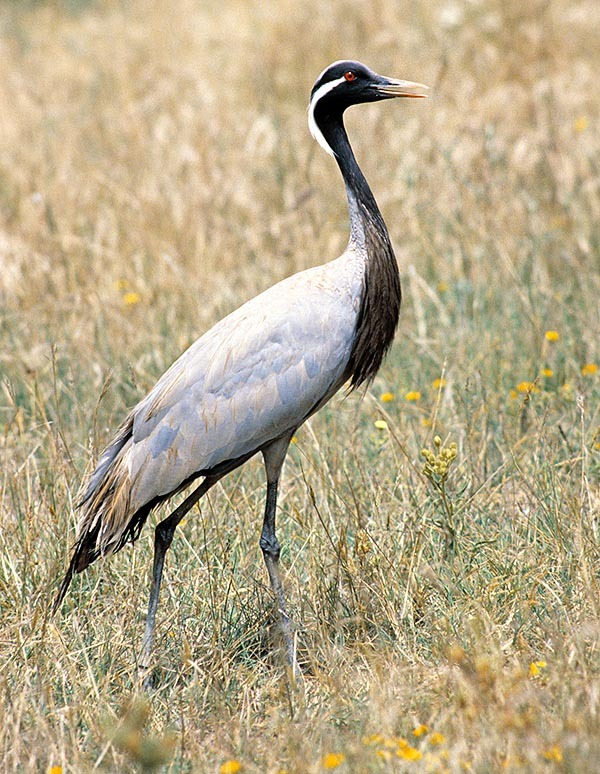 In German Jungfernkranich, in Dutch Jufferkraan, in Swedish Jungfrutrana, in Spanish Grulla damisela, in Russian красавка[, in English Demoiselle Crane, in French Grue Demoiselle, in Hindi Karkara and in Italian Damigella di Numidia. It has a purely Asian diffusion even if, among its wintering sites, besides the Indian subcontinent, it reaches the upper course of the Nile, in southern Sudan. It nests in an almost linear ample zone included between the 45th and 50th parallel of north latitude, with the limits from the northern coasts of the Black Sea up to the Chinese Manchuria and, out from this range, in very few other isolated places in particular in eastern Turkey where it seems that it is regaining an old site of nidification abandoned during the gone centuries. During the last two centuries, it has been extirpated from Spain and from the Balkan Peninsula, mainly due to the anthropic pressure and persecution but also due to the introduction of agricultural modifications resulting in disappearance of areas previously inhabited by the species. In Africa, where are old traces of its presence, it is nowadays somewhat rarefied even if leaving small and isolated colonies in some places presenting characteristics suitable for their permanence. In Morocco, some small colonies do survive on the Atlas Mountains but even if strongly protected, they have not been able to reach during these last decades, numbers sufficient to ensure a sure future. Isolated cases of nesting, although not repeated, in Chad and in Mauritania. 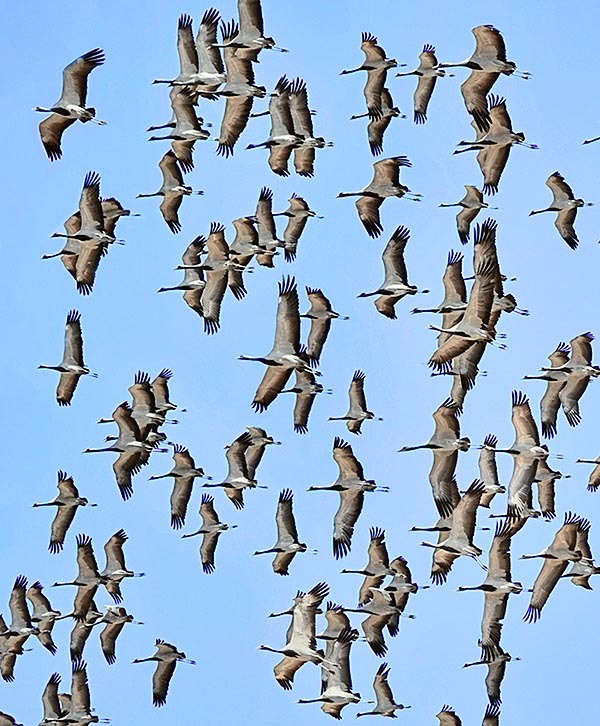 The cranes of these colonies have a separate migration from the Asian species and the same is rather short seen that they reach, for wintering, the nearby Lake Chad. It is a bird not easy to sight even if its size is remarkable, and this because it nests in desolate areas comprised between the boreal zone and the arid steppes of central Asia, zones subject to not easy environmental conditions and little anthropized. Moreover, when migrating, it keeps exceptional and for some traits very long altitudes, therefore it’s often beyond our vision. As the Russian ornithologists maintain, it is easier to hear than to see them during their migrations. 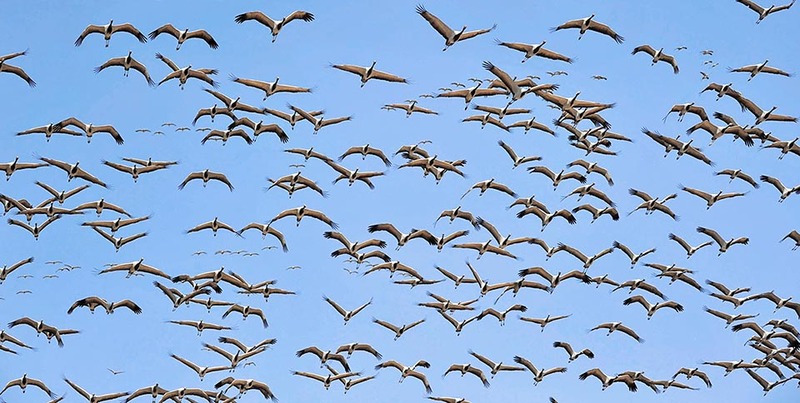 Like all cranes, it is a very noisy bird and when flying it emits continuously that terrible, hoarse and awkward, but in the mean time fascinating, garruu garruu krrrr honk-krrrr honk which may be heard at kilometres far away. In the wintering areas they merge in enormous flocks and only in these places it is possible to understand their numerical consistency. The current estimates show the global presence as in 200/240.000 specimens. Exceptional is the afflux of this crane in a locality of the Indian Rajasthan, at the limit of the Thar Desert in the small village of Kichan, where, traditionally, this bird is awaited, welcomed, protected and nourished by the population during the long periods of wintering. They get there already by the end of August and leave during the following month of March. A tradition which seems having even modified, unawarely, the migration of these birds, arresting them in one of the stops of their southwards movements, in an area not suitable for their presence, enticed by an extraordinary availability of food. The cranes spending these long winter months in Kichan are now 10.000, with a daily consumption of grain of more than 700 kg, from donations and offerings by International Associations and by the local population itself. Fateful are their flights over the Himalaya and the Karakoram, where, at impossible altitudes and at unsustainable temperatures, they defy twice a year their frail and troubled life of migrants. Even if it is the smallest crane, the Demoiselle crane can reach the weight of 3 kg, the total height of 100 cm and a wingspan between the 165 and the 185 cm. The adult male is slightly bigger than the female. With the congeneric Anthropoides paradisea of South Africa, it is the only crane with the head completely covered by feathers without any bare part and missing totally of the red colour on the head which identifies all other species. It has a compact grey ash colour crossed by a wide frontal black belt which form the throat goes down on the chest thus forming a slight and elegant apron. The nape and the rear part of the neck are whitish with a slight tuft leaning backward. Present are also two small white auricular tufts which, from the eyes, go down merging on the nape. The primary flight feathers and the lower belt of the secondary ones are black; the tail is hanging, typical of the Gruiformes. The eyes have a bright orange red colour. The beak is yellowish and robust. The juveniles have a paler grey colouration, with paler head and neck, little developed and less visible auricular tufts. It is unmistakable also among the cranes themselves, provided these characteristics can be observed. They usually lay two eggs in a small dimple dug in the ground in a completely open and usually bleak habitat. They spawn directly on the ground rarely adding clumps of grass, pebbles or roots they often tear off directly while staying on the nest. The incubation lasts about 29 days, with the young flying away after 8/9 weeks more, which is the shortest period among all the cranes. The sexual maturity takes place from the second year. It is thought that the pair is monogamous and that the union lasts for all the life. It seems that in the wild they reach an average life of more than twenty years and it is a species which can be domesticated easily and easily reproduces in captivity. Their natural foes, especially during the nesting time, are seagulls and crows and great birds of prey (Eagles, Buzzards and Harriers), as well as mustelides and foxes. The nesting takes place usually in isolated pairs even if often the nests are arranged in such a way that the possible calls of a pair can be heard by the adjacent one, this for normal social liaisons and territory delimitation as well as for fighting all together the approaching of possible enemies. Generally, during the hatching the male keeps watch not far away going up on small elevations of the ground, advising and contrasting the approaching foes. It is rather easy, while crossing the immense prairies of central Asia, to observe the behaviour of these birds, erect and alert like small soldiers silhouetted against the absolute nothingness, ready to take off and emit their alarm cry as soon as one gets close to their territories. Once adult, they mainly nourish of vegetables and seeds but also of worms, small vertebrates, lizards and amphibians whilst the feeding of the young is widely integrated with insects. The young stay with their parents during the first year and even during the first migration. 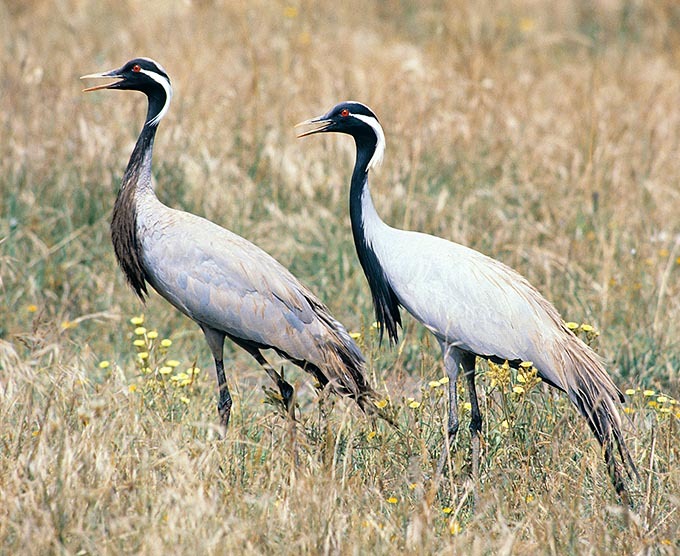 The Demoiselle crane, like all cranes, is a protected species in the entire world. There is an ancestral and historical respect in many of the areas they frequent even if some nations (especially Afghanistan, Pakistan and Sudan) hunt it regularly, killing more than 5.000 individuals every year. 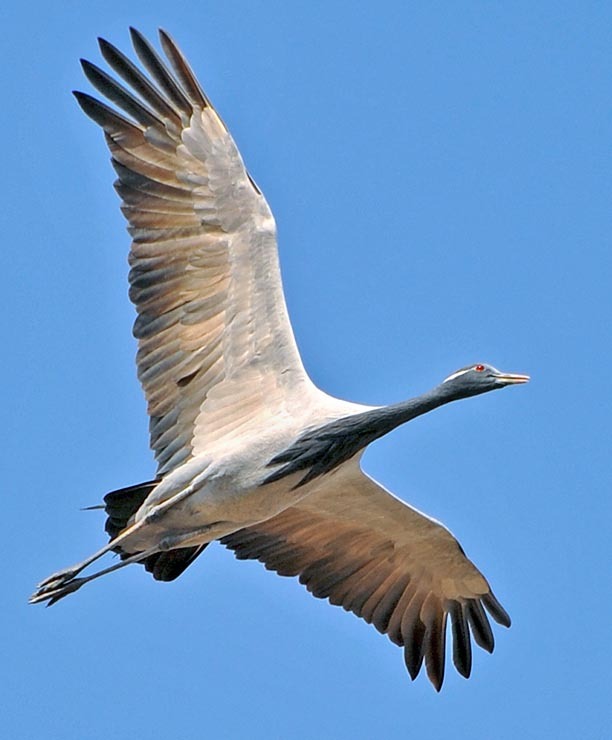 The crane, without distinction in the species, is often object of worship and active part in traditions handed down through the centuries by populations which see in this animal and in its wandering in the skies, a divine sign. Dances and festivities in their honour take place n many locations of the Indian subcontinent. It is not an endangered species and is placed in CITES II.